Corporations and law firms want to keep up-to-date with the wide range of initiatives and codes of practice on CSR, and with policies being used by other companies. The book is divided into four sections as follows. This includes trends in different jurisdictions and areas which may be subject to legislation rather than "soft law". This includes coverage of source materials including codes of practice published by organisations such as the UN, the ICC, the OECD, the Global Reporting Initiative and various financial institutions. This includes CSR principles in specific sectors such as banking and finance, clothing, pharmaceuticals, food and drink, energy and professional services. 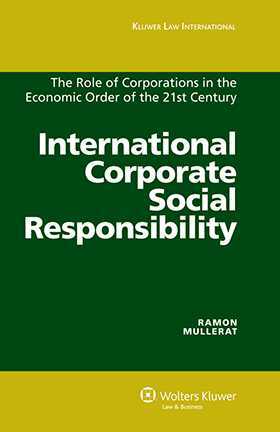 This includes examples of CSR policies from international corporations such as Coca Cola, Dell, Ericson, Hewlett-Packard, Ford, General Electric, Mitsubishi, Shell and Wal Mart. About the Author Foreword Preface Chapter 1 The Concept of CSR Chapter 2 Names and Definitions Chapter 3 CSR Basic Debate Chapter 4 Delimitation from Neighbouring Concepts Chapter 5 Models and Types of Thinking Chapter 6 History Chapter 7 Drivers and Dividers Chapter 8 Corporations Chapter 9 Corporate Reputation Chapter 10 Corporate Social Contract Chapter 11 Corporate Citizenship Chapter 12 Globalization Chapter 13 Benefits Chapter 14 Management and Business Strategy Chapter 15 Triple Bottom Line Chapter 16 CSR and Human Rights Chapter 17 CSR and Social Rights Chapter 18 Developing Countries Chapter 19 CSR as a Tool to Fight Poverty Chapter 20 Environment Chapter 21 Measurability Chapter 22 Stakeholders Chapter 23 CSR by Areas and Countries Chapter 24 Self-Regulation and Codes of Conduct Chapter 25 CSR and the Media Chapter 26 TNCs and CSR Chapter 27 Small Companies Chapter 28 CSR Literature Chapter 29 NGOs and CSR Chapter 30 Examples of Business-CSR Relationships Chapter 31 Reporting Chapter 32 Partnerships Chapter 33 CSR in Some Specific Sectors Chapter 34 Liberal Professions Chapter 35 Research Collaboration Chapter 36 Socially Responsible Investment Chapter 37 Voluntary or Mandatory Chapter 38 The Norms on Transnational Corporations with Regard to Human Rights Chapter 39 Institutions and Other Entities Chapter 40 Award Chapter 41 Criticism Chapter 42 New Realities and Trends Chapter 43 Conclusions. Bibliography. Index.